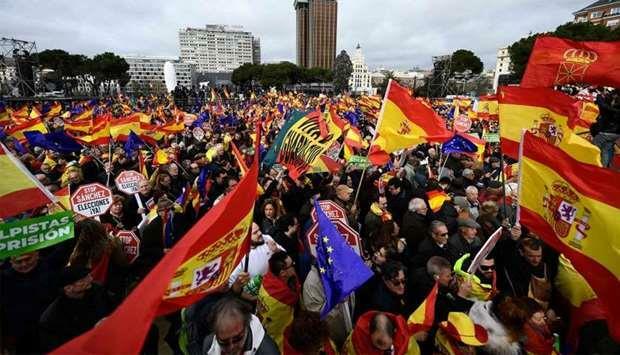 (MENAFN - Gulf Times) Tens of thousands of people took to the streets of the Spanish capital Madrid on Sunday to call for national unity and protest against the socialist minority government of Pedro Sanchez. The large demonstration on the central Plaza de Colon, called by the conservative opposition parties and the populist right-wing Vox party, was held under the motto: ‘For a unified Spain: Elections now!' The protest organizers accuse the government of being too soft in its dealings with the separatist regional government in Catalonia. ‘Sanchez has deceived us and said that there would be elections, but until today that is not the case. Now he will listen to us,' said the leader of the liberal Ciudadanos party, Albert Rivera, on Twitter.